A Visit to Broadway again. Family events & our Trips we make. We had some nice weather and a weeks holiday so we decided to take the car for a spin to one of our favourite places, Broadway in the Cotswolds. We have visited this great little village many times and have climbed the big hill up to the monument but today we just wanted to look around a bit. so here is a bit from Wiki about Broadway for you . Broadway is a large village and civil parish in the Worcestershire part of the Cotswolds in England. Its population was 2,540 in the 2011 census, a small increase on the 2,496 in the 2001 census. It is situated in the far southeast of Worcestershire and very close to the Gloucestershire border, midway between the towns of Evesham and Moreton-in-Marsh. Often referred to as the "Jewel of the Cotswolds", Broadway village lies beneath Fish Hill on the western Cotswold escarpment. 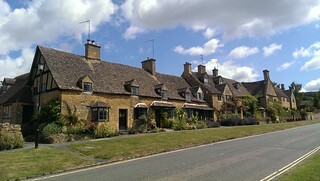 The "broad way" is the wide grass-fringed main street, centred on the Green, which is lined with red chestnut trees and honey-coloured Cotswold limestone buildings, many dating from the 16th century. It is known for its association with theArts and Crafts movement, and is situated in an area of outstanding scenery and conservation. The wide High Street is lined with a wide variety of shops and cafes, many housed in listed buildings. On the way back we called in on Bourton-on-the-Water another nice little Cotswolds town, however if you pick a nice day it is rammed and you can’t move in fact I think that China had invaded that day ! !.